I hadn’t heard about Thanksgiving until I moved to Texas. Yet, I took my first shot at cooking the meal that cold fall of 1997 in the vast yellow plains of Dallas. Inspired by the glossy food magazines, cookbooks and TV shows, and wanting to immerse myself in the American experience, I baked, cooked and stirred while feeling homesick for my family’s home-cooking. It took years of living in the US for me to grasp the depth and warmth of the holiday and the menu, many failed turkeys and side dishes along the way. It turns out, fifteen years later, the Thanksgiving feast has become such a relevant part of our lives that if we ever moved back to Mexico, I’d have to bring it back with us. The connection wasn’t instantaneous. Slowly, some elements began to resonate within me. Take the bird: Turkey is an indigenous ingredient in Mexican cookery and a center piece for Christmas and the New Year. Both are holidays which also happen near the end of the year, during the coldest season, and have to do with gathering family and friends around a plentiful table. And being thankful. And hopeful. Regardless of the many recommended takes on turkey I tried, it wasn’t until I came up with my own Mexican version (it’s in my new cookbook please get it!) that the Thanksgiving turkey felt like part of our home and our home grew deeper roots in the United States. Now my Mexican turkey is part of the Thanksgiving menu, we eat every year with our same dear American friends, along with Debra’s butternut squash soup; Tamara’s fennel, pear and parmesan salad; Sean’s changing sides (as my turkey replaced his, he is finding his way on the sides territory – sorry Sean, but you’re the one who chose mine…); Viviana and Mario’s very berry sauce; and David’s chocolate pecan pie and home made ice creams. This year, I have some sweet potato rounds with a punch to share. I realize the Thanksgiving menu has a permanent side to it: dishes that become part of it tend to be recurring for decades and very few get added or replaced along the way. I envision these sweet potato rounds will have the same fate as my turkey: repeated appearances and a big chance of permanent status. Just like turkey, sweet potatoes are so familiar to me. Called Camote in Spanish, from the náhuatl Camotli, they’ve been part of Mexico’s culinary lingo since pre-Hispanic times. Mostly eaten cloaked in sugar or with a sweet spin, baked or roasted, they are culturally linked to the figure of the Camotero, a street vendor selling warm and soft sweet potatoes and plantains to order on a pushing cart, that moves around the city on cold evenings, turning people’s cravings on with the tune of its piercing whistle sound. Here in the US, I’ve come up with a speedy, savory, irresistible take that can be a companion to whatever you may serve on your Thanksgiving table and will perk up the entire meal. The best part: this will be a stress-free dish. It takes only four basic ingredients and it can be eaten warm, lukewarm or completely cooled. 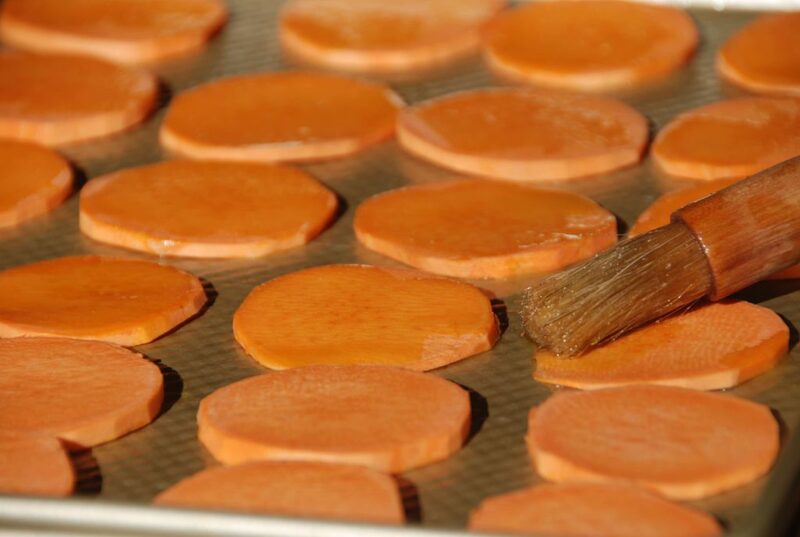 Just slice the sweet potatoes into rounds, you can do that ahead of time. Brush them with a combination of melted unsalted butter and olive oil. Yes, please use both, it tastes so good, trust me. Generously sprinkle your favorite ground chile blend to cover on both sides. 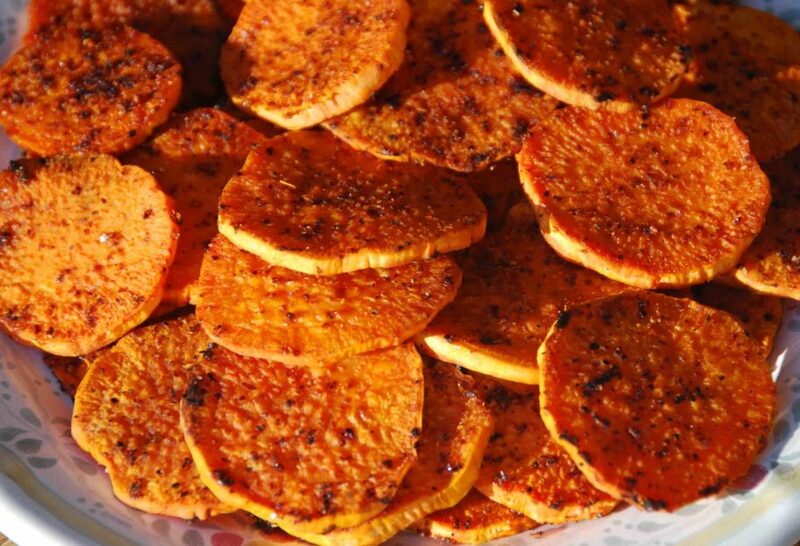 The rounds will fly off of your platter, so bake plenty: they are thin and soft with a sweet bite on the inside, and lightly crispy on the outside with that lightly spicy, deliciously tart and barely salty seasoning. It is during Thanksgiving when I most realize how fully Mexican I can be in the United States, and how much the US has grown on me. And I feel immensely thankful. Having come from Mexican grandparents who were once immigrants too, who made their home in Mexico, missing my Mexican parents and family, and now raising my Mexican-American family in the US… now I get it! Just like so many people, I can’t be pigeonholed. And rather than feeling at a loss, I relish in the diversity of it all. Wishing you a happy and plentiful Thanksgiving (with some punchy bites). Rinse and peel the sweet potatoes. Slice them into thin rounds of about ¼ inch. Place oven racks on lower and upper thirds. Preheat oven to 400 degrees. In a small saucepan melt the butter over low heat. Once it melts pour in the olive oil, combine and remove from the heat. Brush the butter/oil mix onto the bottom of two large baking sheets. 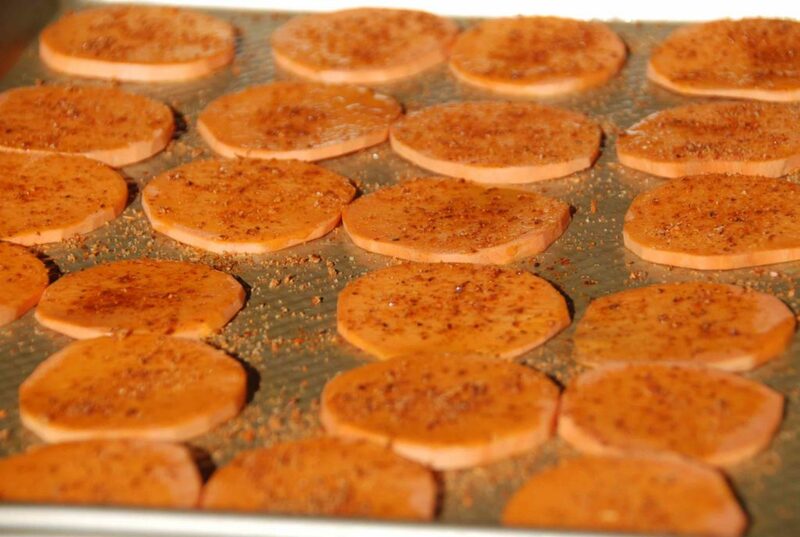 Place the sweet potato rounds in a single layer. Brush the tops with more of the butter/oil mix. In a small bowl, combine the ground chile, the salt and the sugar. 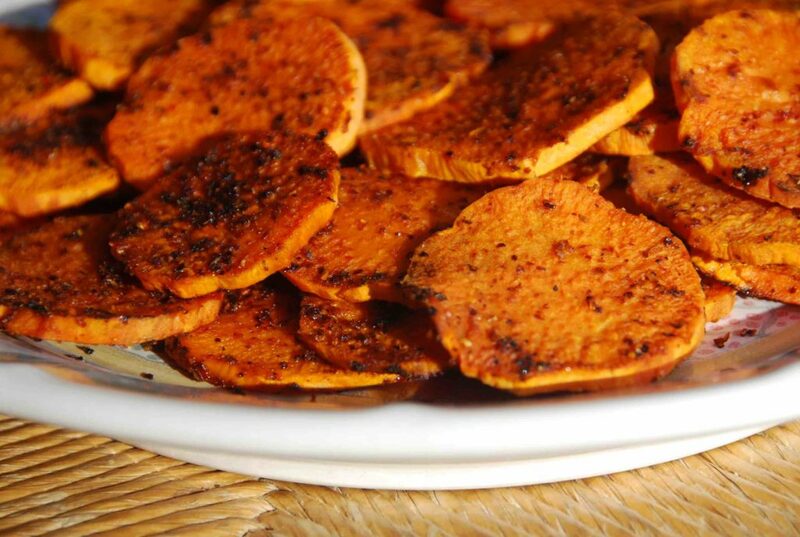 Sprinkle the sweet potatoes generously with ground chile blend. Flip rounds on to the other side and sprinkle generously with ground chiles. Place in the oven for about 20 minutes, or until they have started to brown. Remove baking sheets. 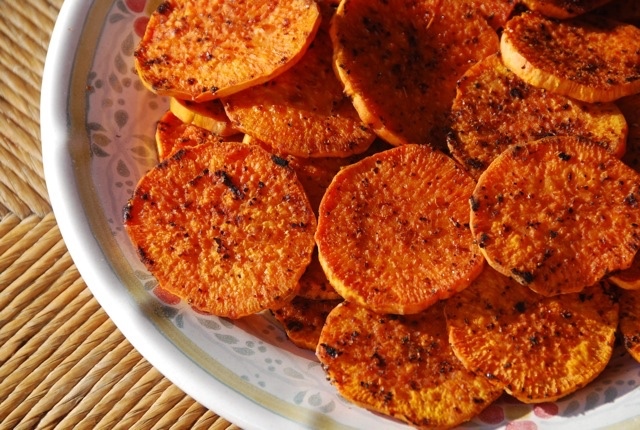 With a set of tongs or a pair of forks, flip the sweet potato rounds. Place back in the oven for 12 to 15 minutes more, until they have browned on both sides. Don't let them burn. Remove them from the oven. As they cool a little, their edges will crisp a bit more. Serve hot or not: either way they are delicious! Pati vivo hace 10 anos en Estados Unidos y hasta ahora me entero que las que presentas en la foto no son las papas dulces son lo que llaman en espanol Camote o Yam en ingles. La papa dulce es blanca. Mira y veras. Yo tambien juraba que estas eran las papas dulces. Seguire la receta, de culaquier manera. Paty , solo una nota para decirte q ayer fue la primera ves que te vi !! Me encanto tu programa!! The nopales looks delicious !! But the plantain bread made get out of my bed to write down the recipe !! Gosh !! I cant wait to make it !! Chica me siento muy feliz de verte de que seas mexicana y estes en este canal y con esas ganas de compartir todo los colores y sabores de la cocina Mexicana !! Hello Pati, I saw your show for the first time on Jan 27 2013 and love it! I am very fond of Mexican food and have not been able to convince my husband. After seeing you prepare the chicken milensa and the chipotle potatoes, I may have a winner! Will keep you in my “favorites” and have shared your site as well as the tv shows with my daughter-in-law (she loves to cook Mexican style foods)! I hope he likes it Connie!! Thanks for having me on your “favorites”, it really means a lot. I just made the Sweet Potato Rounds with a Punch this afternoon. They are fabulous! I never much cared for sweet potatoes as a child and as an adult have grown to like them a little bit, but made this way, I absolutely adore them! While I am sure I could eat an entire batch myself in one day, I am trying to make them last a little bit longer that, but I am not sure I will succeed. My husband and I watch your show together and very much enjoy your enthusiasm about the food you prepare. I like to try different recipes all the time and am so glad I have such a wonderful show as yours to watch and learn about Mexican food. Thank you so much for sharing your passion for good food. Keep up the good work! Muchas gracias Cynthia!!! Aren’t these addicting? Hola, Pati! My wife and I “discovered” you on Create TV, and we love to watch and learn. (We have become fans not only of your show, but of poblano chiles as well.) We thoroughly enjoy the energy you bring, and how you tie the history and culture of Mexico together with its food. I often find myself wishing I could be part of your crew, smelling (and tasting!) the wonderful recipes you prepare. We also love how you sometimes involve your family – like having one of your boys swoop through the kitchen and grab something to eat. It all makes for a show as fresh and wholesome as the dishes you prepare. Thank you for all you do! Pati, my husband and I watch your show every evening and we love the recipes, new ideas and cultural information you share. He has really bad dairy allergy so we have really enjoyed your vegetarian-vegan recipes and hope you share more with us. We are quite taken back by your large red mixer! It is amazing and wonderful. What kind is it? We searched the web for about two hours one evening after the show and cannot seem to find one like it. Thank you for doing such a wonderful program! Hola Lynette, Thank you so much for watching the show!! There will be a whole chapter dedicated to vegetarian foods in my cookbook! Also, the mixer is made by Viking. All the very best to you and your husband. Hi Patti, I have been watching and recording our shows now for several weeks. I’m so glad I found you. I have been inspired. My family was getting tired of eating the same old “Mexican food” since it tends to be a daily diet in our home. We’re Mexican American. Now that I have watched your show, I have introduce a few new recepies, and the kids love it, and so does my husband. Thank you for you and your show. Hola May, Thank you so much for watching the show!! The song is “Dame” by Domingo Siete! Hola Jolanda, They should carry Tajin Classic Seasoning in the international section of your grocery store. If you can’t find it there, look for it at your local Latin market. Hola Norma, Mexico City is my favorite place in the world so eat, so it’s no wonder your family misses the food so much! I have a sweet tamales recipe that would be good for the winter: http://patijinich.com/2011/06/blackberry-and-pecan-tamales.html. No tamales verdes or churros yet – but I will try to get recipes up soon. Thank you so much for watching the show!! That is such a creative use for Tajin! I always have it on hand since we like it on fruit, but sometimes I’d like to try something different with it. Yum!! Naomi, I love TAJIN on fruits too. But try it on the sweet potatoes…I couldn’t stop eating them!! Your English is quite good, both in speaking and writing. Did you speak the language when you grew up in Mexico? Did you learn how to cook from your mother or grandmother? Honestly, I did not like Mexican food until I saw your show. Thank you for introducing your kind of Mexican food to me and the audience of America. Hola Lily, I took a little English in school, but mostly learned from living in the United States. Thank you for watching the show!